Tag Archive | "Orient Express"
While in many parts of the world, train travel is simply the fastest and most efficient way to travel from point A to point B. But there are still some train journeys that exist merely because they are a pleasure in themselves, that they offer a unique insight into the landscape that the train takes you through, or because they perfectly encapsulate the old saying that the journey is more important than the destination. There is something very old-world about the pace and style of this type of train travel. In this article we take a look at three of our favourite train journeys. This train in Norway takes you from the capital city Oslo all the way to Bergen – it is considered to be one of the most beautiful, exciting and scenic train journeys in the world. 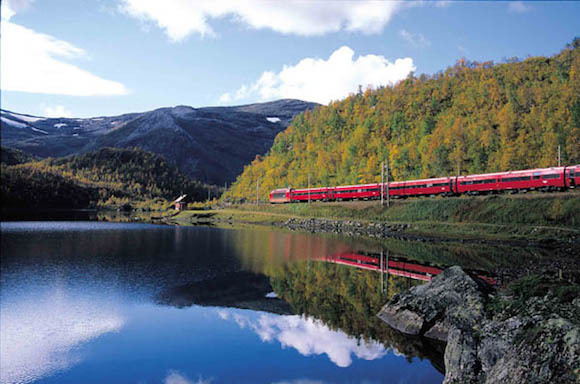 One of the unique aspects of this train is that it travels across Europe’s highest mountain plateau – the Hardangervidda, travelling above the tree line through this rugged terrain. This train is surprisingly busy in winter as it is one of the main points of access for Norway’s winter sports resorts. One of the most popular places to stop en route is the small town of Finse – this was the location that George Lucas used to create the ice planet Hoth in the 1979 movie The Empire Strikes Back. An express in name only, this unique train journey in Switzerland holds the dubious honour of being the slowest express train in the world. While it is express in the sense that you don’t have to change trains at all, it will take you nearly eight hours to travel the 291 kilometres of this journey from St Moritz to Zermatt. The reason that the journey is so slow is because the train is traversing the steep mountainsides of the Swiss Alps and the scenery is spectacular. The Glacier Express has become such a tourist attraction that the train’s first class carriages have now been fitted with panoramic windows that extend right up over the ceiling of the carriage making your journey through the stunning mountain ranges jaw-droopingly exciting. It’s impossible to think of journeys on the Orient Express without bringing to mind the famous murder/mystery novel written by Agatha Christie. Thankfully murders are quite rare on this incredibly historic train, but it is an exciting way to travel nevertheless. Dating back to 1883, the route of the Orient Express has changed many times over the years, but its name has become synonymous with luxury train travel across Europe. Today’s Orient Express travels from London to Venice, and features some of the original carriages from the historic Orient Express trains. If you are not in a hurry, if you are more interested in immersing yourself in the world around you than dashing off to your next meeting, then you should definitely consider embracing the old world charm of some of the great train journeys in the world.